The use of insecticides and fungicides is sometimes necessary, though keeping sanitary conditions and giving the plants all the elements and nutrients they need to thrive will generally lessen the need for these things. Synthetic insecticides and fungicides are the most effective, but there are several natural or organic types that can be used with various degrees of success. 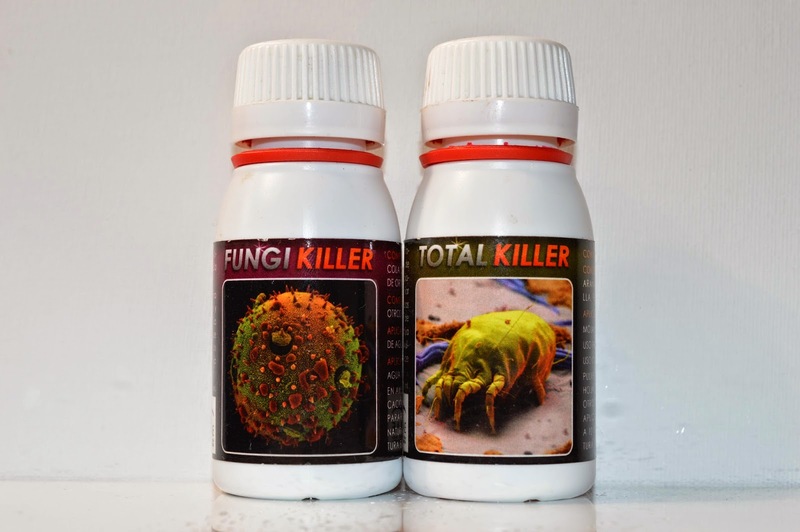 The main reason why the natural types of insecticides and fungicides have become much more popular over the past decade or two is that the synthetic versions have become drastically more difficult for the average hobbyist to buy. Another reason is that a lot of people wish to be more environmentally friendly and reduce the use of synthetic substances. In Norway it is practically impossible to get hold of synthetic types because the use of them is so heavily regulated. It is possible to buy some ready-made stuff on spray bottles, but this is already mixed and one little spray bottle doesn’t last long (and is expensive too). It is possible to get hold of things in other countries but bringing such substances into Norway is illegal. Many natural forms of insecticides and fungicides work fairly well, some even very well. Still, it makes it much more difficult to combat an outbreak of e.g. red or false spider mites and the mealy bug when you don’t have access to any systemic synthetic insecticides. Personally I believe the authorities are too strict on this (I can only speak for my own country here). The amounts of insecticide needed by the hobbyist are very small, and when compared to the amounts released into the soil and rivers by professional farmers it amounts to no more than a literal drop in the ocean. The problem with pest resistance against insecticides is probably a more sensible argument for the strict laws, yet the lack of available insecticides can make life difficult for the hobbyist. Synthetic insecticides usually work best when they act both on direct contact and systemically by being absorbed through the plant roots and spread in the plant’s sap so that sucking insects will die from ingestion. The lack of systemic action is the main problem with natural insecticides as none of them (so far as I know) work in any other way than on direct contact. With some pests direct contact is easy enough to do but in most it is not. At least it is not easy if they’re spread over a large collection or if any of the plants have spines, areoles, ribs, creases and crevices or hairs and wool, in which case there is plenty of places for the little devils to hide. In other words, when it comes to cacti natural insecticides are more difficult to apply usefully than with other plants that may be happy to only develop widely spaced leaves. Among the many natural substances that can be used to combat insects are garlic, chilli, milk, lemon and vinegar. These can be mixed with water and sprayed directly on the plant. Some of these work better than others according to what I’ve read, and some of them may potentially harm the plant. The most popular natural insecticides are so called “soaps” or insecticidal soaps. They’re usually made up of a lot of water, some natural or essential oils, and some form of detergent. There may also be other substances present. Such soaps can be bought or made at home. The detergent is easy of course easy to find, and it’s chief role is to break the water surface tension, thus allowing the liquid to easily coat all the plant matter and the insects themselves. The essential oils come from various trees and plants known to have various insecticidal effects. One of the more commonly used is Neem oil from the Neem treee. It is possible to buy this essential oil and mix it yourself with detergent and maybe something like garlic juice to create a spray that will in most cases work effectively to kill insects on direct contact. I have personally tried such soaps with various ingredients, chiefly with Neem oil, chilli and garlic, but I can’t say it had much of an effect. Spider mites that I tested it on died fairly quickly, but as mentioned above it is difficult to spray this efficiently over a large collection. There will always be some insects left that just weren’t hit by the spray. Organic fungicide on the left based on horsetail and nettle extracts. I’ve found it to be only somewhat effective. have been scorched – though not all my plants were so effected. Plants are generally more sensitive to mineral soaps but, whenever using a soap of any kind it is strongly advisable to test it first on a couple of plants and only on a small area of said plants before spraying a whole collection. Another alternative is to make brews with plant material containing naturally occurring poisons. One way to create such an insecticide is to buy a packet of cigarettes, break them all open and pour the tobacco into a bowl of water. Let the mixture stew for a day at least and sieve it. You’ll then have a concoction containing nicotine which is a very potent nerve poison and the basis for many modern synthetic insecticides (using neonicotenoids). Another poison is solanine, a substance occurring naturally in members of the nightshade family such as tomatoes and potatoes (in fact, eating approximately two kilograms of green tomatoes can be deadly!). Some members of the nightshade family contain dramatically higher levels of solanine than tomatoes though, and brewing a tea based on the fruits of some of these plants will allow you to create a concoction potent enough to be used as an insecticide. This is all a bit time consuming though, and in the end it’s difficult to know exactly how potent the concoctions are and whether or not they’ll be efficacious on the specific pests you wish to combat, or whether or not the plants themselves will be damaged by them. A substance known as malathion is used in some insecticides around the world, and also occurs as the active substance in some synthetic lice cures (though at a reduced concentration). I have never tried this but I suppose it may be useful against some pests unless the amount of malathion is too small. The main use of fungicides are to prevent little seedlings being killed off by fungi. Adult plants rarely need to be treated with a fungicide unless it is to prevent fungi attacking a wound of some sort. If one keeps very clean conditions during sowing and makes sure that no fruit remains are still attached to the seed, it’s usually not necessary with fungicide for sowing either. Sterilising the soil and seeds (if one wishes) is another way to reduce or eliminate the need for fungicides. As with insecticides, the synthetic ones are the most effective. They are also more difficult to acquire. And similarly to insecticides, fungicides can also act systemically and/or on direct contact. Among the organic or “natural” fungicides there are plenty to choose from, some of which will work far better than others. There are many different recipes on the Internet for creating concoctions with a fungicidal effects as well as information about natural substances that are supposed to be fungicides. A simple search will yield many results. Such things as garlic, vinegar, milk and various conservatives typically used when making jam are all cited by various people as having a fungicidal effect. 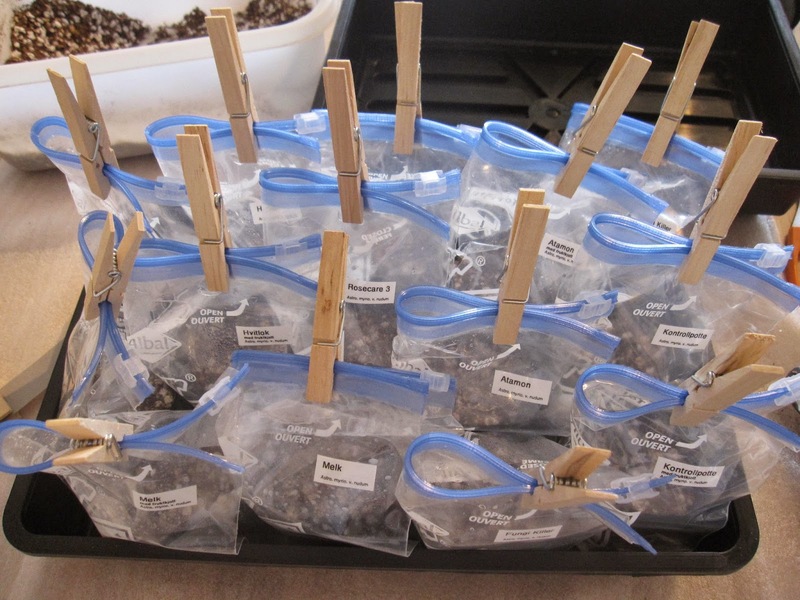 I’ve tried all the above methods in a semi-scientific experiment I did a year ago in which I sowed seeds of a single species in pots with and without fruit remains attached, sprayed the pots with those different substances as well a synthetic fungicide and kept them all separate in plastic bags. Compared with pots in a bag that was not sprayed with anything (control pots), the experiment showed that milk was harmful (it was supposed to act as a fungicide in that it promoted growth of beneficial fungi to kill the harmful ones); vinegar and the conservative ineffective; garlic maybe had a slight effect (though it smelled terribly); organic fungicide based on plant extracts had some effect; and finally the synthetic insecticide had the best effect. The control pot wasn’t really much effected by fungi either, so it’s hard to say to what extent the above fungicides had a positive or negative effect, or no effect at all. The sample size was far too small to say anything meaningful statistically. Take it simply as an anecdote therefore. a small sampling size it is impossible to say something statistically meaningful about the results. Some growers report that using fungicides (especially synthetic ones) have a negative impact on germination rates. Personally I have not had the same experience and for me synthetic fungicides are the way to go. Then again, keeping things squeaky clean and sterilising the soil will likely remove the need for fungicides altogether. I should also say that no matter how much you sterilise the soil or use fungicides, fungi may still spread. If you see the typical silvery white wisps of hair-like filaments spreading on the surface of the soil you should immediately remove it from any nearby pots and either spray it with some form of fungicide or add sand or grit to bury the fungi. Especially if you don’t have an effective fungicide the pot should also be placed outside of its enclosed humid atmosphere.